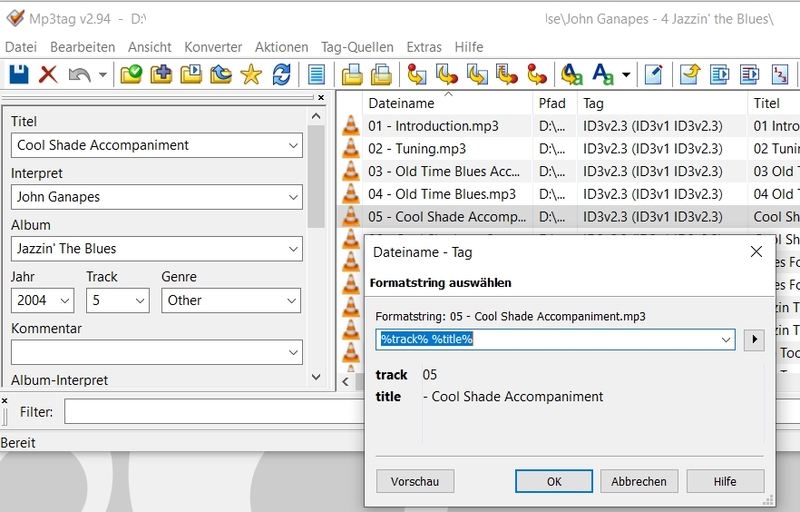 If a filename would be '05 - Cool Shade Accompaniment.mp3', by calling 'filename to tag' I will see the right formatstring '%track% %title%'. 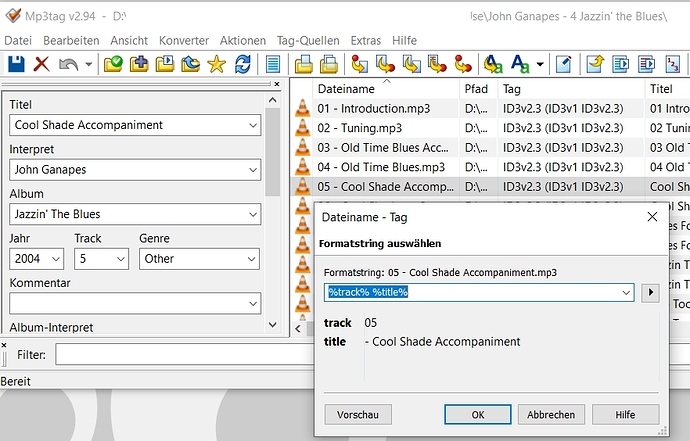 But as a result I will just get %title% for this renaming as then would be "- Cool Shade Accompaniment.mp3" - the tracknumber '05' would be omitted. Next, a tracknumber minor to 10 would be crippled and by using %track%. For '05' I just get a '5' instead of '05' for a filename. %track% %title% is not the right formatstring for this filename. You'd need to adjust it to the format of the filename. In this case, the track number is delimited by " - " from the title, so you'd need to use that as delimiter. Thanks for your kind reply and sorry for the flaw in my format string. As a result, the correct string didn't change the game. I've also uninstalled my v2.94 and installed v2.94c for a fresh start, it didn't matter also. Of course I could insert the tracknumber by manual editing, but a format string would be so much better. For me everything looks fine. (there is a number in the field track, it has a leading zero, the information for the field TITLE is also written to the correct field). So: what did you really expect? 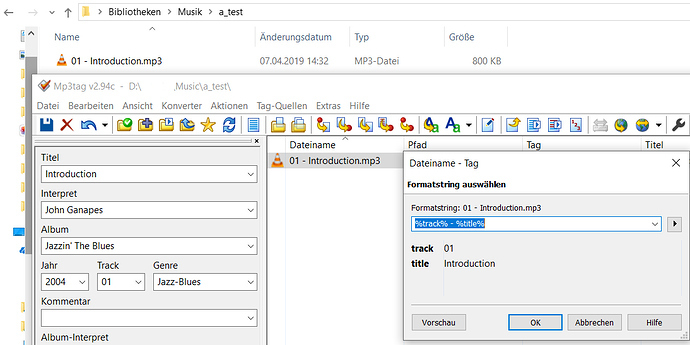 I really expected to read "01 - Introduction" as a title instead of a mere "Introduction" after the execution of "filename to tag" . In very former versions it worked, as far as I would remember it. YES, now it works again. Shame on me, I don't know I was such a moron not to do it right at once on my own. Thanks a lot, I'll really have to donate.